The recipe for a perfect ski vacation is simple. Optional: stir in a fun non-ski activity. Store the family in luxury accommodations. Another key to success: this was all provided free, by ski.com and Snowmass to the winners of TravelingMom’s Dream Big Ski Vacation in Aspen! A Connecticut family of 4, including a tween and teen, won the Dream Vacation contest ski vacation. The accommodations were five-star with a spectacular view of the mountains. The amenities and services provided by the helpful Snowmass hospitality staff were top notch. The Four Mountain Rental Staff was most helpful and pleasant. The ski equipment was top of the line and brand new. Both my sons spent the first two days in ski lessons… Both ski instructors were extremely knowledgeable, patient and pleasant. My boys could not have had a better experience. The third day of our trip we went on the Krabloonik Dog Sled ride. What an experience! One that we are sure to remember and speak about for many years to come. The entire Krabloonik staff was just terrific. Alex was somewhat unsure about going on the sled, the staff was very reassuring and made his experience one he is still talking about. We went on the morning ride and had delicious gourmet lunch afterward. The restaurant is a charming, rustic log cabin set into the picturesque mountainside. The four of us spent our last full day in Snowmass skiing together creating memories that will last us a lifetime. They all rented top of the line ski equipment, and both boys took ski lessons. 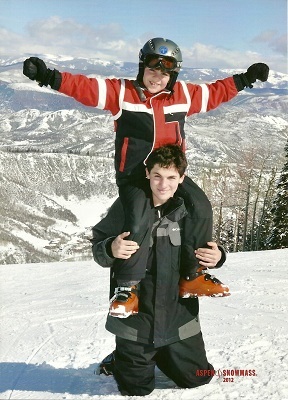 Some skiers stop taking lessons when they can adequately navigate intermediate terrain, but their teen, already an advanced skier, learned how to ski very difficult terrain. The youngest winner improved from advanced beginner to intermediate status after just 2 days of lessons. Kids as young as age 3 can take lessons at the Ski and Snowboard School, under the patient guidance of the well-trained staff. There is licensed daycare at the Treehouse Kids’ Adventure Center, which takes children from 8 weeks to 4 years. Young skiers also use the adventure center for lunch and breaks. With one lift ticket, you have access hundreds of alpine trails from beginner to expert, on Snowmass, Buttermilk, Aspen Highlands, and Aspen Mountain. Snowboarders can hit terrain parks and halfpipes. Snowmass is the most family-friendly of the 4 mountains; the Treehouse Center is right there. Aspen is where you find ritzy boutiques. You might also see celebrities here, either on the slopes or at dinner. You can also take a guided snowshoe tour, go cross country skiing or enjoy in town activities. Families can head to the City of the Aspen Recreation Center, which offers ice skating, pick up hockey games and rock climbing. The dream vacation winners had the adventure of a lifetime with a 2 hour Krabloonik Dog Sled Ride on the third day of their trip. Each sled, led by 10 Alaskan sled dogs, can pull two adults and a young child. Kids under age 3 are not allowed, and child prices apply for kids ages 3-8. Morning and twilight sled rides are followed by a gourmet meal, and the afternoon ride is after lunch, all at the log cabin Krabloonik Restaurant. There is a children’s menu available. You can also take a family snowmobile ride with a Snowcat dinner ride. This is a more economically priced option that includes a family-style western barbecue served in a rustic cabin. Aspen/Snowmass offers a free concierge service so you can plan your own dream family ski vacation; they help with everything from equipment rentals to ski school reservations, childcare and dinner reservations. The Dream Big Ski Vacation in Aspen was a joint venture of TravelingMom, TakingtheKids.com and Family Travel Forum. My dream family holiday would also be a skiing one, so much fun!